Since I've gotten back in to my planner I've been wanting functional, yet pretty ways to divide & use my planner so I stay inspired to use it. Not only does this house my editorial calendar - which is what I was planing on only using it for - but it also houses some life plans & inspiration. I wanted this place to be a place where I can dump all my inspiration & thoughts and then draw from later. I want to keep it functional yet pretty. While at the craft store the other day I found some Project Life & other Project Life style cards on major clearance so I picked some up. I was surprised at the amount of cards that come in these packs & I'm totally stocked up for life. I found the Midnight Collection on clearance and am so excited because it's pretty much all black & white which means I can rely on colorful accents to create an inspiring place. Don't tell Zach but I'm really into black & white right now.....I used to complain about black & white sooooo much! But I find that these cards - both the B&W and the colorful ones I picked up, washi tape, sticky notes, etc add the color I crave and the organization I need. Dividers - The bigger, 4x6 style cards are great to use as dividers! If you punch them on the longest side you can create a top divider & if you punch it on the shorter side you can create a side divider. Then the bigger space offers a place to put relevant sticky notes or goals for that section. I think these are better to divide a bigger section into smaller, more manageable sections. I also use them to flip to the current day. Note Jotters - The smaller size cards are great to grab & write a small note on. If something is important - like an appointment or date or phone number - I keep a stack of pre-punched small cards in a pencil case for easy access. Since they are smaller, storing them clipped into my planner I find bulks up the planner and makes it uneven. But these small, decorative scraps are perfect to fill out and then toss when you're done with the task. 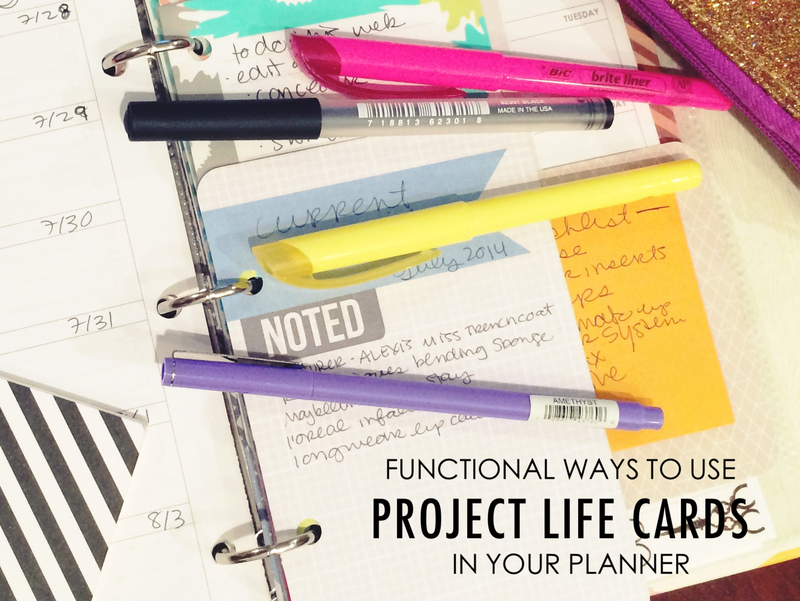 Running Lists - I currently keep a Project Life card on the current week in my planner with my cleaning schedule on it. The card itself is broken into a Sunday - Saturday schedule perfect for a cleaning list. I do this because I realize when I don't clean during the week I am unhappy on the weekends. Project Life cards offer a lot of prompts in addition to plain cards so these are great for keeping running reminders or lists that need to be carried over from week to week. Another thing I want to accomplish with my planner is to use the stationery I love to hoard. My problem is that I buy stationery too pretty to use - and that's not what it's for! Getting some of these PL cards on clearance means I don't feel too bad about ripping them out when I'm done. How do you use your favorite craft supplies to stay organized? Any other tips for Project Life Cards?